Pilot briefing – check. Goggles and helmet donned – check. Am I ready to takeoff on the flying adventure of a lifetime – definitely check! The radial engine rumbles, the propeller spins and the faint smell of fuel rises around me. Within minutes I am gliding down the grass runway with the sun on my face and the warm breeze blowing through my hair. Soon we are soaring 1,500 feet above the beautiful orange groves and lakes of central Florida. I am barnstorming in a New Standard D-25 original Flying Circus bi-plane with pilot Rob Lock at Fantasy of Flight (www.fantasyofflight.com), an aviation-themed attraction in Polk City, Florida, just twenty minutes west of Orlando. Rob is the owner of Waldo Wright’s Flying Service (www.waldowrights.com) who offers daily flights at Fantasy of Flight. The 360 degree view, only possible from an open air cockpit, becomes a work of art. The brown and yellow patchwork of fields and farms dotted with green patches of orange groves creates a living canvas. This is a small reminder of what central Florida looked like before Walt Disney’s famous land purchase resulted in the tourist mecca that is Orlando. There is an unquestionable adrenaline rush when flying in an open air cockpit where there’s nothing but a lot of air between me and the landscape below. Unlike larger aircraft, you can feel every bump and turn in a smaller plane. Every movement is exaggerated. Some people prefer a smooth ride with nice gentle turns so they can see all the landscape. Others, including myself, want adventure and for those people the pilot can roll in and out of steep turns and throw in some aggressive maneuvers to provide that adrenaline rush. After one more 180-degree turn, we head back to the airstrip. The landing is soft and easy, and we sputter to the hangar. “People always get off the plane happy and smiling,” Rob says. He’s right. I feel lighter, fresher, more carefree. And as I walk back to the hangar, I can’t wipe the grin off my face. 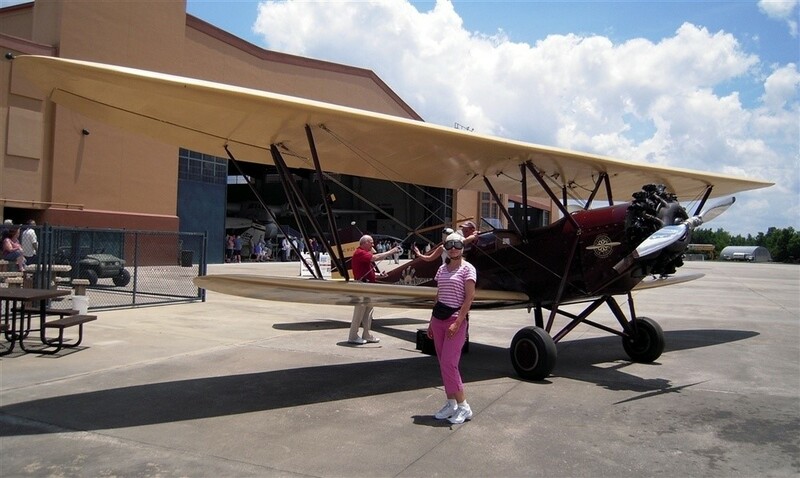 A flight in the 1920’s New Standard D-25 bi-plane will transport you back to a time when life was simpler and slower paced. This plane truly represents the Golden Age of Aviation and offers passengers a rare look into the past. 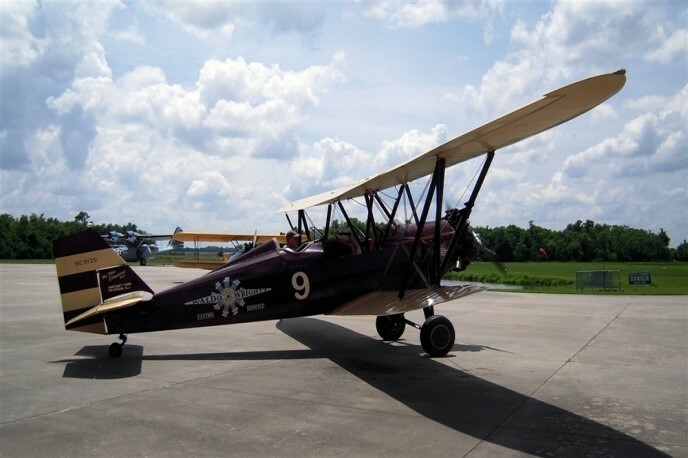 There are only a few of these celebrated airplanes still operating today; in fact, Waldo Wrights Flying Service owns two of the seven presently airworthy and flying. The plane was designed specifically for barnstorming at the request of Ivan Gates, the proprietor of the famous Gates Flying Circus. Carrying four to five passengers in a large front open cockpit, the plane was instrumental in introducing tens of thousands of people to their first airplane ride, back when aviation was in its early stages. The plane has led a very interesting, if not, amusing existence. 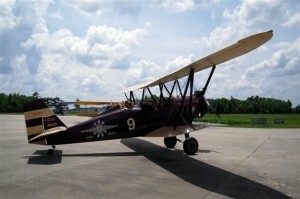 The first few owners used the plane to haul passengers at fairs and local air shows. However research in the FAA records shows that in early 1934, the plane was caught smuggling in booze from Canada during prohibition and was seized by the FBI. The interesting fact is that the plane was seized from the JJ Fitzgerald Farm which was owned by Joe Fitzgerald who was the grandfather of President John F. Kennedy! 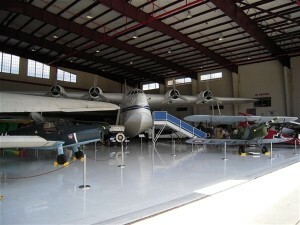 For those who wish to remain on the ground, Fantasy of Flight has something for everyone. In addition to the world’s largest private collection of vintage aircraft, visitors can enjoy themed immersion experiences, flight simulators, interactive exhibits, a tram tour of aircraft maintenance areas and daily tours of the restoration area and backlot. History buffs will love the Tuskegee Airmen – They Dared to Fly exhibit and the multimedia tribute to the Women Airforce Service Pilots (WASP) – A Passionate Pursuit. Kids and families alike will love climbing aboard the huge 1944 Short Sunderland flying boat and also scampering through a B-17 Flying Fortress, where the bomb hatch offers the sensation of flying over enemy countryside. They’ll also enjoy the Fun with Flight kid zone where they can experience this hands-on, interactive area which introduces the basics of flight through a variety of unique experience stations. From designing and testing paper airplane creations to piloting a state of the art hang glide simulator, the entire family will be busy for hours. What I find the most interesting at Fantasy of Flight is the fact that every plane is air worthy. Owner Kermit Weeks does not believe in displaying static aircraft. 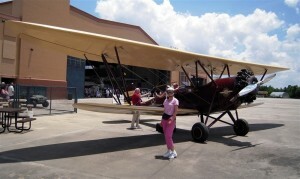 Each vintage plane that he acquires is carefully restored to flying condition. This is perhaps the only aviation attraction in the world that has a daily Aircraft of the Day aerial demonstration complete with pilot question-and-answer sessions. This is a rare opportunity to see these vintage aircraft in flight performing flight maneuvers for spectators. Hours are 10 a.m.-5 p.m. daily, and general admission is $28.95 for adults, $14.95 for children and free for children under age 5. All special events are included in the price of admission. Audio tours, hot air balloon rides and biplane rides are available at extra charge. 1400 Broadway Boulevard, SE, Polk City, FL 33868 (863) 984-3500.